THE man who invented Infrastructure NSW yesterday told Barry O’Farrell to just get on with building light rail from the CBD to Randwick after the Premier squibbed on a decision. Mr O’Farrell instead ordered a feasibility study into the $1 billion project. Max Moore-Wilton, who came up with the idea of Infrastructure NSW and is soon to be appointed to its board, said the government was dragging its feet on what could be the iconic project of Mr O’Farrell’s first term. The government has been accused of dithering on big issues, avoiding decisions and instead setting up a Kevin Rudd-like number of reviews since the March 26 election. The latest study will look into a light rail servicing the Sydney Cricket Ground, Sydney Football Stadium and Randwick Racecourse. “It’s a project where people would see an improvement quickly and see the O’Farrell government was focused. I don’t think we should do massive studies and all the rest,” Mr Moore-Wilton said. 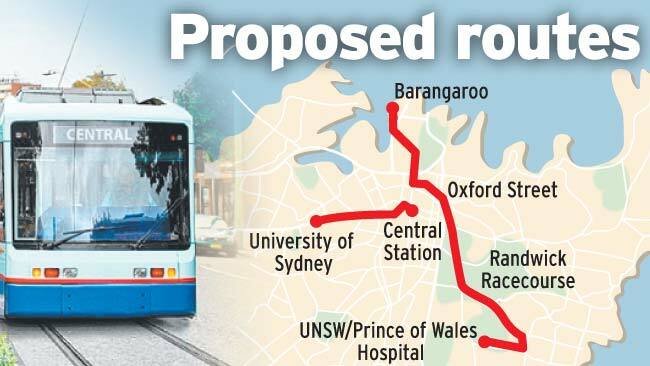 One proposed route would travel from Barangaroo to Castlereagh St, up to Oxford St, along Anzac Pde and then down to Randwick Racecourse, Prince of Wales Hospital and the University of NSW. Another extends the existing line from Lilyfield to Pyrmont via Central with another link from Central to the University of Sydney. Mr Moore-Wilton said the city’s existing state of “gridlock” was untenable – and light rail was cheaper than heavy rail projects and could be built relatively quickly. “If we’re going to extend it through to Randwick – and I think we need that to be a great sporting city – it makes sense to take it into the city as well,” he said. Representatives from the City of Sydney and Transport Minister Gladys Berejiklian’s office have started discussions about light rail. “The Department of Transport has set up a project team to examine the feasibility of light rail through the city centre and from the city to the University of NSW and from Central to the University of Sydney,” Ms Berejiklian said. Randwick Council and racing authorities are also understood to want Mr O’Farrell to do more than just a study. A senior racing source said transport from the city was the big advantage Melbourne’s Flemington track had over Randwick.